To improve the search ranking of your Web site, it’s a good idea to use a directory structure that is shallow — in other words, to limit the depth of your subfolders. When you upload files to your Web site, you place them in directories. A siloed directory structure has a top-level folder for each main topic, subfolders within each main-topic folder for its related subtopics, and individual pages inside (as shown in the figure). Linking then naturally follows this structure, effectively reinforcing your directories through links. The URL lets you know where the page is. 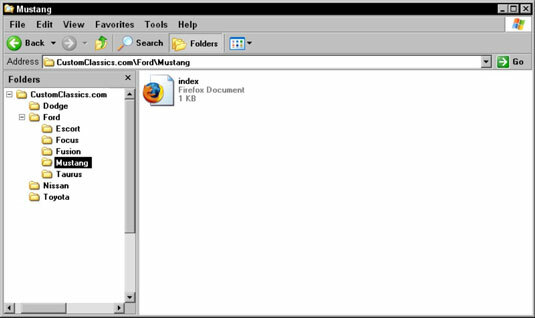 Notice how the page named “index.html” is saved within the folder named “mustang,” which is a subfolder of the main directory “ford.” This page is only two levels deep in the site structure, which is good. The more clicks it takes to get from the home page to the target page, the less important it is deemed by the search engines. Long directory paths make long URLs, and studies have proven that users avoid clicking long URLs on a search results page. Long URLs are more prone to typos. This can discourage deep linking or even cause broken links to your Web pages from other sites. Also, users can make mistakes typing in your URL. So don’t get category-happy. Making your directory structure ten directories deep is bad, having five levels is bad, and even having three levels of subdirectories is still not great. Although there’s no hard and fast rule, you should try to remain quite shallow: One or two levels deep is usually sufficient. The closer the page is to the root of the directory, the more important your page looks to the search engine. Note how shallow the directory structure is: No page is more than three directory levels away from the root.